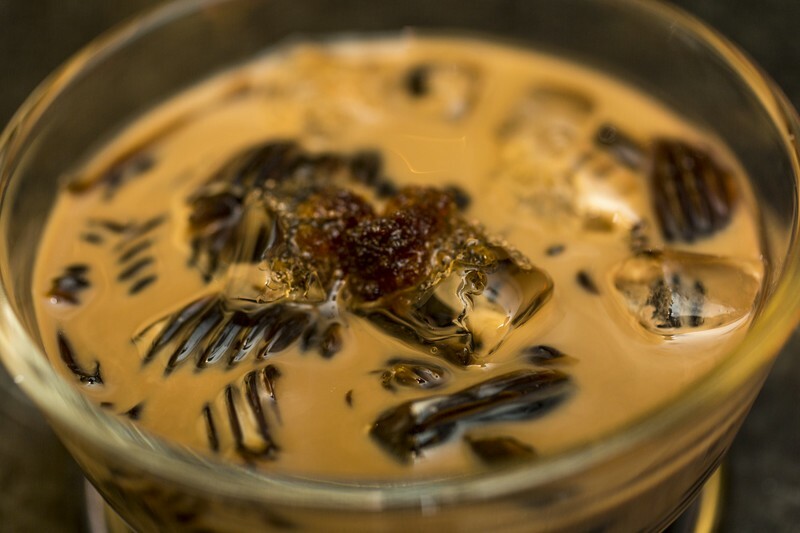 For indexplicable reasons, even though they are close neighbors, there seems to be only a handful of Thai restaurants in Saigon, and rarer still to find one dedicated specifically to Isan cuisine. 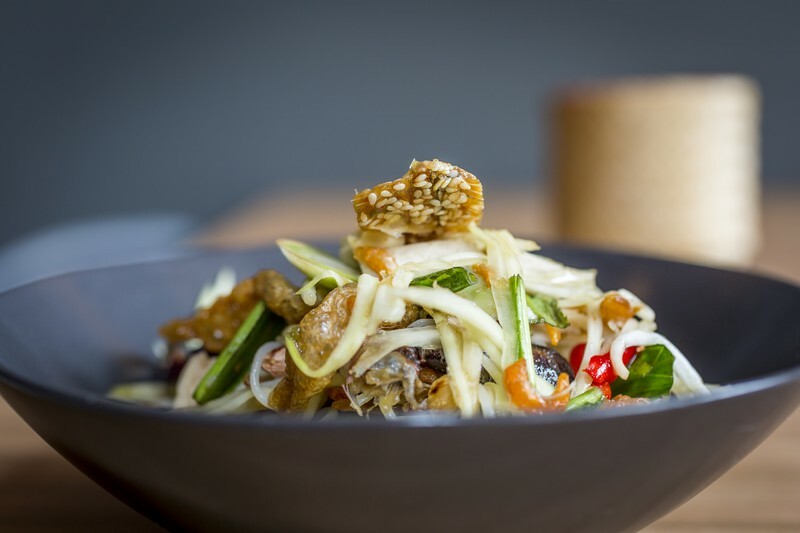 This is where Somtum Der (136 Pasteur, D1) enters the dining scene to fill that gap. 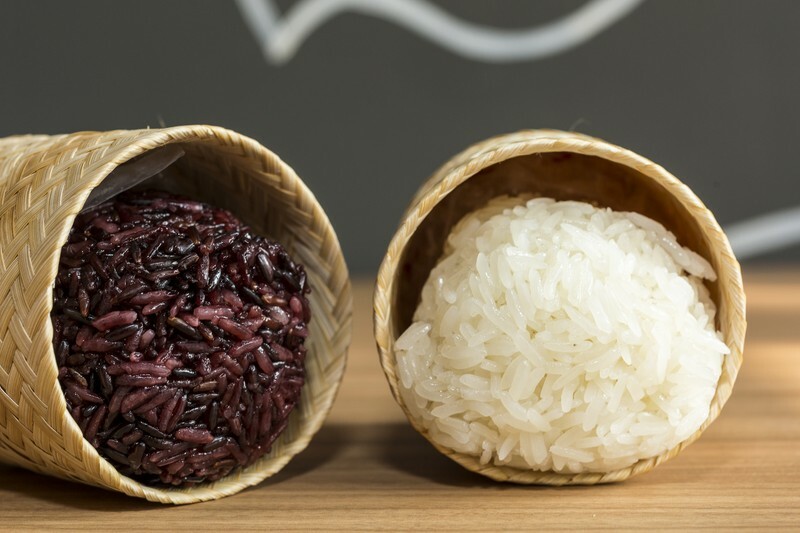 Isan borders on Laos, and regardless of modern political boundaries, the people of the region have traditionally shared a language, a climate (hot, steamy) and a love for two foods: larb and green papaya salad. The new restaurant occupies the second, third and fourth floor of a narrow building above one of the many clothing boutiques that line Pasteur. The entrance is hidden with no sign except for an open hallway painted in deep red with straw lamp shades leading you in and up the stairs. The rest of the décor at Somtum Der is colorful, warm and inviting. The interior is a modern interpretation and nod to Isan culture with colorful patterned fabric on one wall while another is painted in bright reds and yellows with images of Thailand’s countryside. 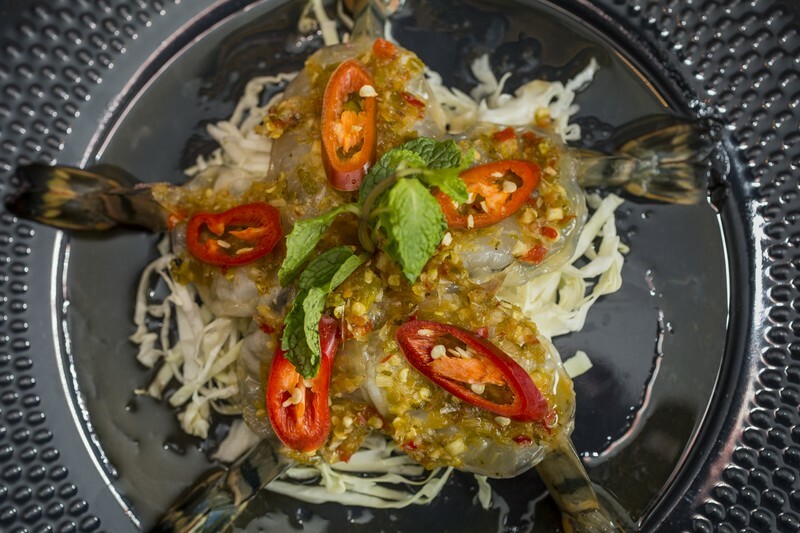 Somtum Der Ho Chi Minh City is their third outlet after the original restaurant opened in Bangkok in 2012 and Somtum Der New York City in 2013. So this is a Saigon replica of a Bangkok restaurant that interprets that city’s street-food renditions of traditional Isan cooking. Amazingly, the food survived the journey, and if it has lost some herbs and other ingredients, it is still vibrant, fresh and delicious. 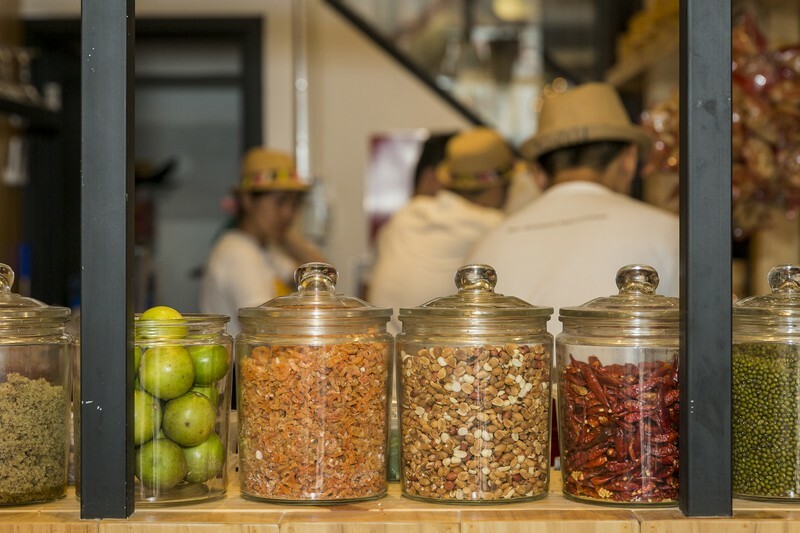 An open kitchen on the second floor is filled with glass jars of spices and herbs used for their signature dish – the papaya salad, or somtum, the restaurant’s namesake. The staff were attentive and service was prompt with a smile. They offered recommendations on how much and what kind of food to order, which were two main dishes, one somtum and a side of rice, and I found the quantity to be spot on for hungry eaters. Between two of us we ordered four dishes, one somtum, a soup and sticky rice as well as fried rice with prawns and it was plenty. 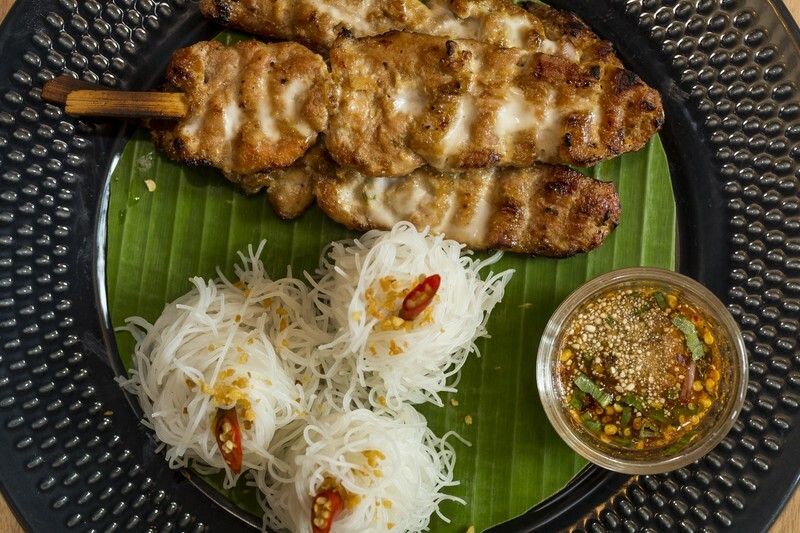 At the heart of their menu is somtum and there is a large variety on offer to choose from so you’ll be sure to find a version that suits your palette. 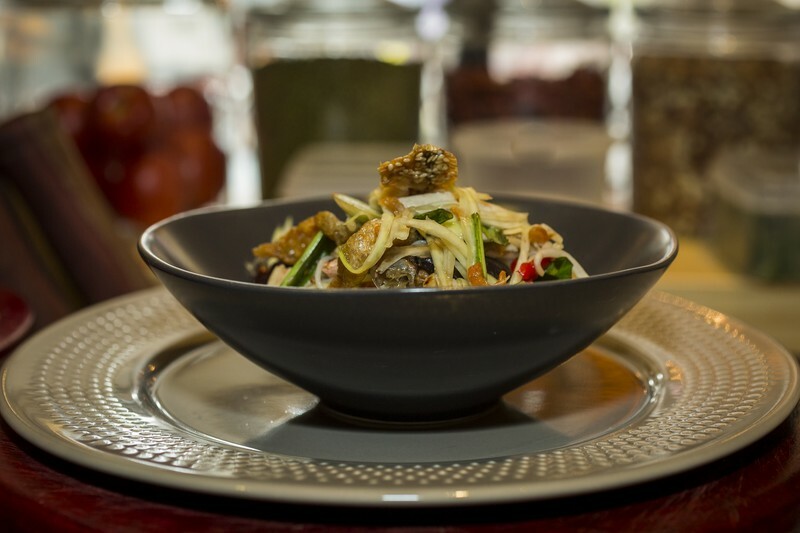 We tried the Spicy papaya salad with nam, pork roll and Isan herbs (Isan style, VND105,000) – the crunch and freshness of the herbs and spices were morish. 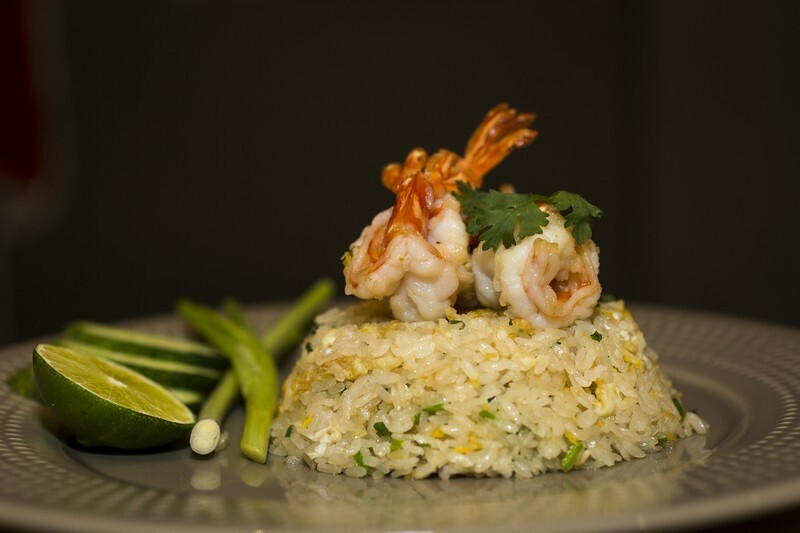 Isan cuisine in general is fresh and spicy. Instead of the green curry that’s often synonymous with Thai cuisine the dishes are light, full of flavor and with a great crunchy texture. The best way to sample everything on the menu is by ordering family style, so select two or three dishes per person and share them with everyone at the table. And that way the decision of what to order won’t be too hard, either. The Thai prawn sashimi (VND150,000) got me intrigued and didn’t disappoint with a thick layer of lime, lemongrass and chili. This is definitely one of the spiciest dishes on the menu and after a few bites of this I was really glad to have the Grilled coconut milk marinated pork skewers (VND105,000) to put out the fire with its soft and subtle flavors. 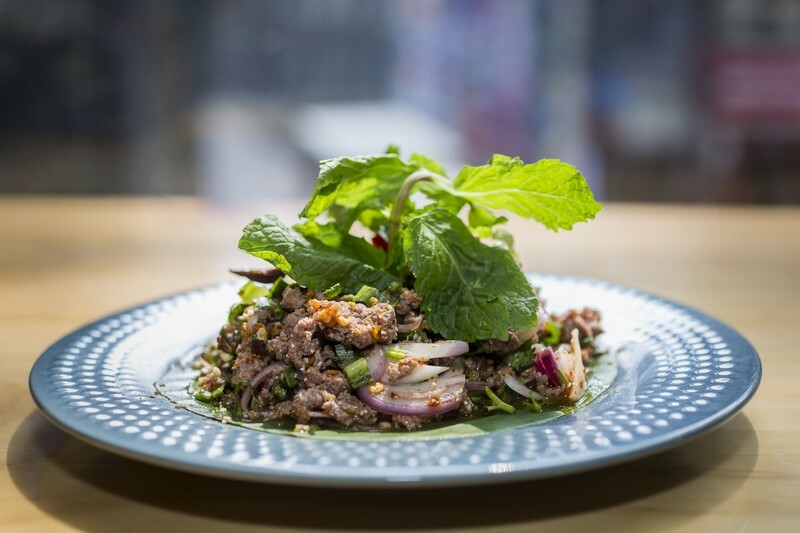 We also shared the Spicy minced duck meat salad (VND85,000) – which somehow they managed to create light and fresh. 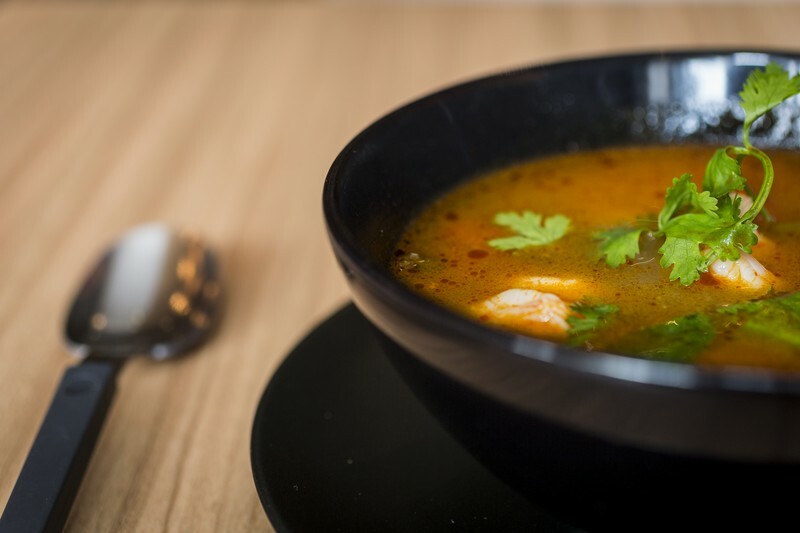 The tom yum soup with shrimp (VND115,000) was different to what you’ll expect, the broth was clear, without coconut, but without compromising any of the flavors expected of this traditional Thai soup. 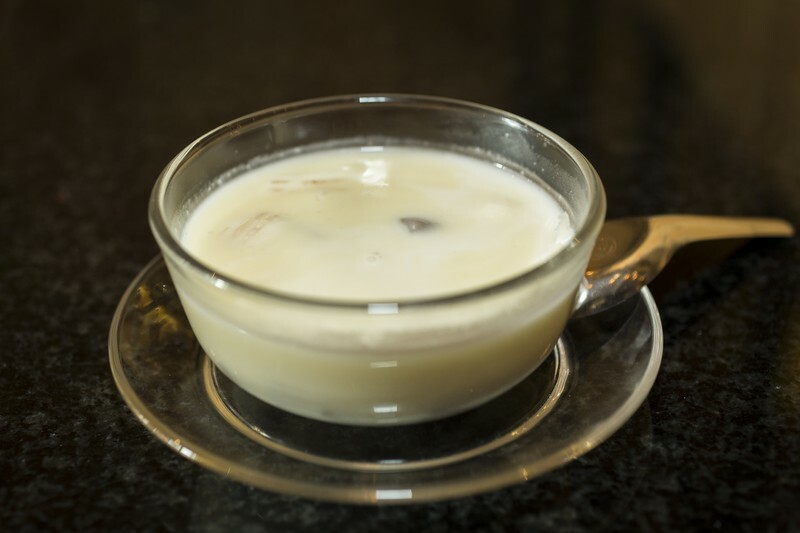 For dessert the Taro in condensed coconut milk (VND35,000) was my favorite and definitely worth saving space for. The drinks menu is small and pairs the food well with a small selection of sweet juices and iced teas, six cocktails and a short beer and wine list. 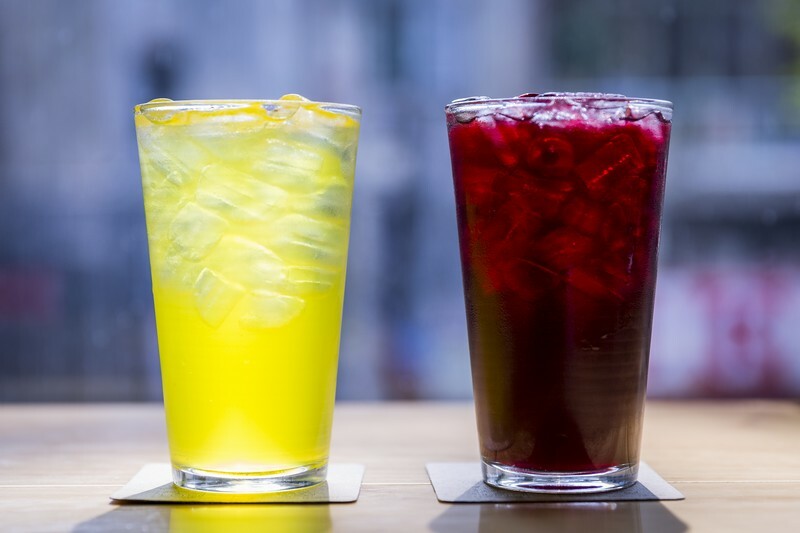 Since most of the dishes are spicy, I suggest going for the Crysantimum juice or Rosella juice (VND30,000 each) as their sweetness will help offset the heat. The latter is a bit more fruity and tangy while the Crysantimum is mellow and sweet. We went during lunchtime midweek and it was busy but not crowded. We enjoyed the relaxing upbeat background music that was distinctly audible but also allowed for easy conversation. If you’re coming on your own you can also soak up the atmosphere sitting at the bar by the open kitchen or watch motorbikes pass by on Pasteur from their big floor to ceiling window.